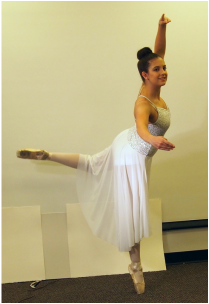 Kristine Orr, artist and recently retired ballet instructor, gave us an incredible opportunity to study, photograph, and paint and draw eight beautiful ballerinas between the ages of 14 – 18. The ballerinas were from Tina Jackson’s "Colorado Dance Center." Although we were a small group of about 12, we had plenty of room to spread out and use large sketchbooks. The room was set up with the tables along both sides of the room with an aisle down the middle. We started the morning with the ballerinas holding poses for 15 – 20 minutes while taking short breaks to relaxed their muscles. 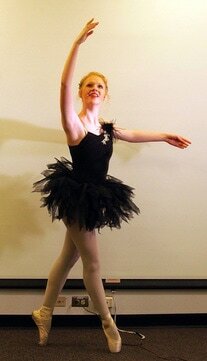 I fell in love with my ballerina and admired her ability to pose, on her toes, for long periods of time. After we had time to sketch, the girls posed in front of a blank wall with spotlights on them to exaggerate shadows and highlights. We were given a lot of time to take reference photos of their poses and costumes. Each one of the ballerinas had three costume changes with Kristine directing them in their poses. I'm excessive about taking photos. Because I have a hand tremor, I have my digital camera set up to take multiple shots while holding the shutter button down. This resulted in over 700 photos. After I edited out the bad ones, I had over 150 good ones. No matter what type of camera someone used, I'm sure they have reference photos they can use for a long time to come. 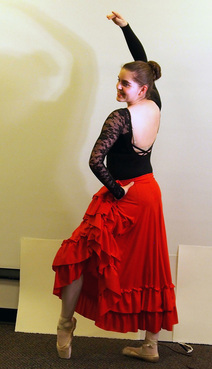 After we took our photos, the girls put on a show including various dance styles and costumes. They are such a talented group of young women! In addition to sketching the girls, Kristine showed us the techniques she uses in her amazing watercolor paintings. Much of her style depends on the preparation of the paper. After taping her watercolor paper (either 140# or 300#) to a support, she lightly spread gesso straight from the jar over various places with a palette knife while trying to avoid the area where the subject’s face would be. After that dried, she lightly rubbed a white candle randomly around a few places on the paper as a resist. She came with a painting already sketched on the paper and was able to finish a distinctive and beautiful painting using watercolors and watercolor pencils. It is not often that an artist has the opportunity to work from a live model. This workshop offered us that opportunity while trying new techniques. This was definitely one of the best workshops we’ve had this year.